PERFECTLY DESIGNED FOR WORKSTATION: This exquisite low profile base design on the mount is compatible with the desk as thin as 0.39" to 0.98", which fits most sit stand workstation. VERTICAL HEIGHT ADJUSTMENT: Suitable for American's average height. 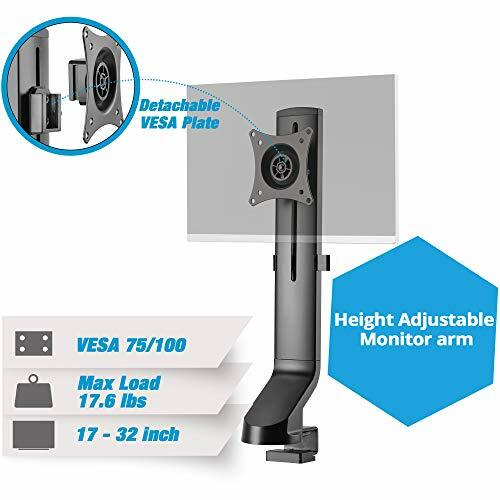 This monitor mount provides extra height adjustment range between 10.2" to 17.7" to create an ergonomic monitor viewing angle to help reduce eye, back and neck strain. HEAVY DUTY MOUNTING: Supports 17" to 32" monitors that weighs up to 17.6 lbs. Rotatable VESA plate patterns with 75x75mm or 100x100mm mounting holes support portrait or landscape monitor orientation. Flexible adjustments to rotate monitor 180 degrees (clockwise/anticlockwise) , tilt ±10 degrees and swivel ±10 degrees. EASY AND QUICK INSTALLATION: The mount easily installs on a sit stand workstation. Both C-Clamp and Grommet Mount are provided for you to decide what method of mounting works best for you. PREMIUM CUSTOMER SERVICE: Our products are backed with a ONE YEAR limited warranty and experienced tech support team in Silicon Valley. If you have any questions or concerns, please do not hesitate to contact us and we will get back to you within 24 hours.